April 2 is World Autism Awareness Day and the month of April is Autism Awareness month. Light it Up Blue was a campaign started by Autism Speaks in 2010. Now before you jump down our throats – we know that there is a love/hate relationship that many people have with that organization. If you’re not familiar with it, you can read about it here or here. But let’s for a moment re-read my first sentence. 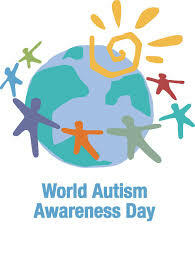 April 2 is World Autism Awareness Day and the month of April is Autism Awareness month. Regardless of how you feel about the organization behind the campaign, Light it Up Blue is meant to raise awareness for all forms of Autism Spectrum Disorder and as a community, this is what we need to be focused on this month. A new study just released shows autism affects 1 in 68 children, up from the previously stated 1 in 88 children. That’s a 30% spike over two years. Autism Spectrum Disorder is a wide, wide net that encompasses a broad range of complex neurological disorders. Individuals can range from mildly affected to severely impacted. You often hear about the geniuses who can do quantum physics at the age of 10 but can’t hold a conversation. For a list of famous people suspected (or confirmed) to have autism check out Wikipedia. You may see videos showing people who can’t speak, some of these stories have then gone on to show that they may not be able to speak, but they can communicate and have heard every word said to them – like Carly. Some have self-injurous behaviour, others have severe motor impairments – there’s even Rett’s Syndrome and of course, who hasn’t heard of Temple Grandin. Both Sabrina and I have kids who are labelled as “high functioning,” but despite a slight regression, MJ has always been verbal, whereas the monkey stopped talking for a year and a half at the age of 2. We are considered to be on the ‘lucky’ end of the spectrum. There is a lot of talk about a cure, and many parents arguing as to whether or not they would want to “cure” their child if one was available. I understand where those parents are coming from. Would you not want to cure your child if they constantly were hurting themselves, or couldn’t go to the bathroom by themselves at the age of 10? I also understand where other parents are also coming from, when they talk about the quirks that make their child unique. My daughter has autism – it is a part of her, but it is not what defines her. Would she be different without autism, yes, but different how? She’d still have the same smile, the same physical features, the same laugh and similar interests – just maybe not as intense. Autism as a diagnosis has been around for about 100 years, but it was used to describe a group of symptoms of schizophrenia. It wasn’t until the ’40s when doctors started using it to diagnose children with emotional or social problems. Back then, the cause of autism was deemed to be “Refrigerator Mother” syndrome, and it was thought that mothers who were cold or unloving/inattentive caused autism. This theory lasted for nearly two decades. That’s a really long time. It’s probably one of the reasons that people have been afraid to speak up – it took 20 years to change one opinion. It’s only been in the last four or five years that more information and studies have been coming to light that show we have barely scratched the surface on understanding this disorder. What causes autism? We don’t know yet – there sure are tons of theories on this, none of which we need to get into here. This post is about awareness. Autism advocacy, understanding and tolerance have come a long way – but it still has a long way to go. We need to raise awareness and we need to educate those who have not yet been touched by autism in their lives. As a mother, I want people to understand that my daughter has a hard time in crowds and that certain sounds sound different to her than they do to the rest of us (like the vacuum cleaner, or a floor fan) and physically hurt her ears. I want them to understand that when she is spinning in circles and not getting dizzy, that while it might look cute or funny, it’s a sign she is overwhelmed by the world around her and it’s the only way she knows how to calm down. I want to stop the looks we get when I have to raise my voice in public just to get her to look at me and hear what I am trying to tell her. I want to stop the “but she doesn’t look like she has autism” comments we get from strangers, acquaintances and even some of our family and friends when she was first diagnosed. So yes, we are Lighting it Blue this year because for the last three years this has been the one colour (besides the puzzle piece) that people have begun to identify with. We hope you will join us in raising some awareness.